"Being married is like having a color television set..."
For the 10th Anniversary of StoryCorps, we are revisiting some of our favorite stories. When we first heard from Danny and Annie Perasa in August 2004, they talked about their first date, an on-the-spot marriage proposal, and their deep enduring love for each other. Danny also shared that he leaves daily love notes for Annie. 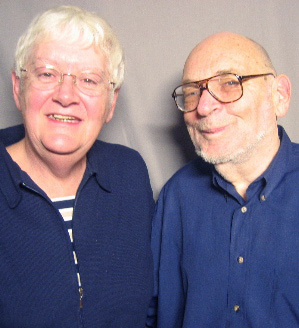 In February 2006, Danny and Annie recorded another StoryCorps interview, but this time it was conducted in their Brooklyn home because as they revealed, he has a fast spreading form of pancreatic cancer. Not long after that interview, Danny died in his sleep at the age of 67. Today, Annie, 71, still lives in that same apartment, and she recently recorded another StoryCorps interview to thank all those who have reached out to her over the years and let everyone know that while she misses Danny, she has his love letters and is doing all right. Originally aired October 25, 2013, on NPR’s Morning Edition. DP: – to make sure she hadn’t changed her mind, and she hadn’t. And every year on April 22 around three o’clock, I call her and ask her if it was today would she do it again, and so far the answer’s been the same. DP: You see, the thing of it is, I always feel guilty when I say I love you, to you, and I say it so often, I say it to remind you that as dumpy as I am, it’s coming from me- it’s like hearing a beautiful song from a busted old radio. And it’s nice of you to keep the radio around the house. DP: The only thing that could possibly be wrong is that I couldn’t find a silly pen. DP: It’s a romantic weather report. AP: -And I love you, I love you, I love you. DP: When a guy is happily married, no matter what happens at work, no matter what happens in the rest of the day, there’s a shelter when you get home, there’s a knowledge, knowing that you can hug somebody without them throwing you down the stairs and saying get your hands off me. Being married is like having a color television set, you never want to go back to black and white. AP: The illness is not hard on me; it’s just, you know, the finality of it–and him, he goes along like a trooper. DP: Listen, even downhill a car doesn’t roll unless it’s pushed and you’re giving me a great push. The deal of it is, we try to give each other hope and not hope that I’ll live, hope that she’ll do well after I pass, hope that people will support her, hope that if she meets somebody and likes ’em, she marries ’em. AP: Yeah, he has everything planned, you know. DP: I’m working on it. She said it was her call. She wants to walk out behind the casket alone. I guess that’s the way to do it because when we were married, you know how your brother takes you down, your father takes you down? She said, well, I don’t know which of my brothers to walk in with, I don’t want to offend anybody. I says I got a solution, you walk in with me, you walk out with me and the other day I said who’s gonna walk down the aisle with you behind the casket, you know, to support her and she said nobody; I walked in with you alone. I’m walking out with alone. DP: There’s a thing in life where you have to come to terms with dying. Well, I haven’t come to terms with dying yet. I want to come to terms with being sure that you understand that my love for you up to this point was as much as it could be and it’ll be as much as it could be for eternity. I always said the only thing I have to give you was a poor gift and it’s myself, and I always gave it, and if there’s a way to come back and give it, I’ll do that too. Do you have the Valentine’s Day letter there? AP: Yeah. (AP Reads Note) AP: My dearest wife, this is a very special day. It is a day on which we share our love which still grows after all these years. Now that love is being used by us to sustain us through these hard times. All my love, all my days and more. Happy Valentine’s Day. DP: (Crying) I could write on and on about her. She lights up the room in the morning when she tells me to put both hands on her shoulders so that she can support me. She lights up my life when she says to me at night, wouldn’t you like a little ice cream or would you please drink more water. I mean, those aren’t very romantic things to say, but they stir my heart. In my mind and my heart there has never been, there is not now and never will be another Annie. AP: I know that people have written to StoryCorps asking if i was still alive. No, I’m still alive and I live with the philosophy that Danny and I always had, it was: Never Say Goodbye. This year would’ve been our 35th wedding anniversary. And I miss my letters from Danny, I do. But after Danny died, I had received thirteen hundred letters of condolences. I mean, I got letters as far away as Beijing, China, you know? Or Paris, France — ’My English is not too well please excuse me, I wish to send my condolences.’ So I would read one a day because Danny wrote me a love letter every day. You know, like people say, ”You must miss Danny terribly.” No. It was an honor to be married to him. So it’s not terrible that I had the time to be with him. You know, life is too short. You come and you’re gone. But Danny didn’t go. He’s not gone because of StoryCorps.